Sul cittadino di Adelaide si decide l' esito del Mondiale 1994 tra l' arrembante Michael Schumacher su Benetton e il figlio d' arte Damon Hill su Williams. 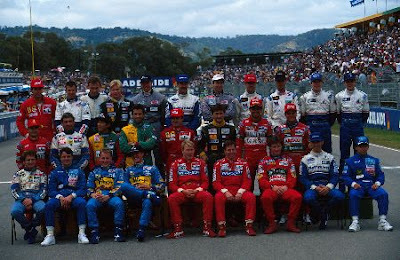 Dopo le qualifiche il più veloce è Mansell (Williams), davanti a Schumacher, Hill e Hakkinen (Mclaren), quindi le due Jordan di Barrichello e Irvine. Al via il tedesco prende il comando e vi rimane per tutta la prima parte della gara seguito come un' ombra da Hill, poi al 36° giro Schumacher fa un errore e tocca il muro danneggiando la vettura, ma torna in pista proprio quando sopraggiunge Hill che non ha visto nulla e tenta un attacco alla curva successiva: Michael chiude la traiettoria e i due vengono a contatto e sono entrambi costretti al ritiro. Schumacher mantiene così il vantaggio di un punto in classifica e diventa Campione del Mondo, ma la sua manovra farà molto discutere. La gara vive invece sul duello tra Mansell e Berger (Ferrari) in grande evidenza dopo delle brutte qualifiche; l' austriaco passa in testa dopo il pit-stop, ma un errore nel finale lo relega al secondo posto. Mansell vince così il suo ultimo GP, secondo Berger e terzo Brundle (Mclaren), quindi Barrichello, Panis (Ligier) e Alesi (Ferrari). 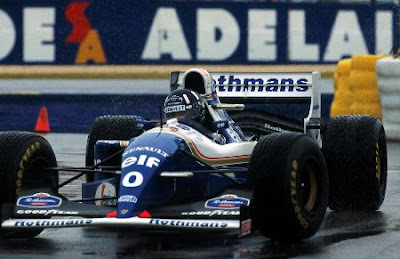 The city of Adelaide you decide the 'outcome of the World Cup 1994 between the' arrembante Michael Schumacher of Benetton and son d 'art Damon Hill Williams. 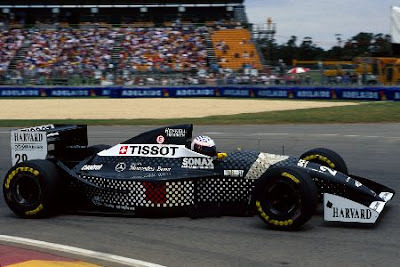 After qualifying, the fastest Mansell (Williams), ahead of Schumacher, Hill and Hakkinen (McLaren), so the two of Jordan Barrichello and Irvine. At the start the German took the lead and stayed there for the first part of the race later as a 'shadow from Hill, then on lap 36 Schumacher makes a mistake and touch the wall damaging the car, but back on track just as occurs Hill he did not see anything and tries an attack the next corner: Michael closes the path and the two are in contact and they are both forced to retire. 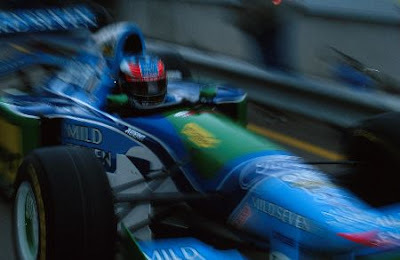 Schumacher holds the advantage of a point in the standings and become the Champion of the World, but its operation will be much to discuss. The race goes on living on the duel between Mansell and Berger (Ferrari) in the spotlight after some bad qualifications, the 'Austrian took the lead after the pit stop, but an error in the final relegates him to second place. Mansell won his last GP so, according to Berger and third Brundle (Mclaren), then Barrichello, Panis (Ligier) and Alesi (Ferrari). В городе Аделаида вы решили «результат чемпионата мира по футболу 1994 года между" arrembante Михаэль Шумахер из Benetton и сын д 'искусство Деймон Хилл Уильямс. После квалификации, самый быстрый Мэнселл (Williams), опередив Шумахера, Хилла и Хаккинен (McLaren), так что два Иордании Баррикелло и Ирвайн. В начале немецкой взял на себя инициативу и оставался там в течение первой части гонки позже, как "тень от холма, то на Круг 36 Шумахер делает ошибку и прикоснуться к стене повреждения автомобиля, но в нужное русло так же, как происходит Hill он ничего не видел, и пытается нападение следующим углом: Майкл закрывает путь, и два находятся в контакте, и они оба вынужден уйти в отставку. Шумахер имеет преимущество точку в турнирной таблице и стать чемпионом мира, но его работа будет многое обсудить. Гонка продолжается, живущих на поединок между Мэнселл и Бергер (Ferrari) в центре внимания после того, как некоторые плохие квалификации, "Австрийский взял на себя инициативу после пит-стопа, но ошибка в последнем отодвигает его на второй план. Мэнселл выиграл свой последний GP так, по словам Бергера и третий Брандл (McLaren), то Баррикелло, пани (Ligier) и Алези (Ferrari).